Signature cocktails and champagne are easy details that will wow your guests! And what’s a wedding without a little bubbly?! Having a cocktail hour? Treat your guests to a signature cocktail that is a mixture of you and your groom’s favorite flavors. Having a grand toast? Skip the generic champagne and surprise your guests with pretty pink champagne. And don’t forget the presentation! Adding simple elements such as striped paper straws, fruit, mint leaves or colored sugar rims take your drink from pretty to perfect. 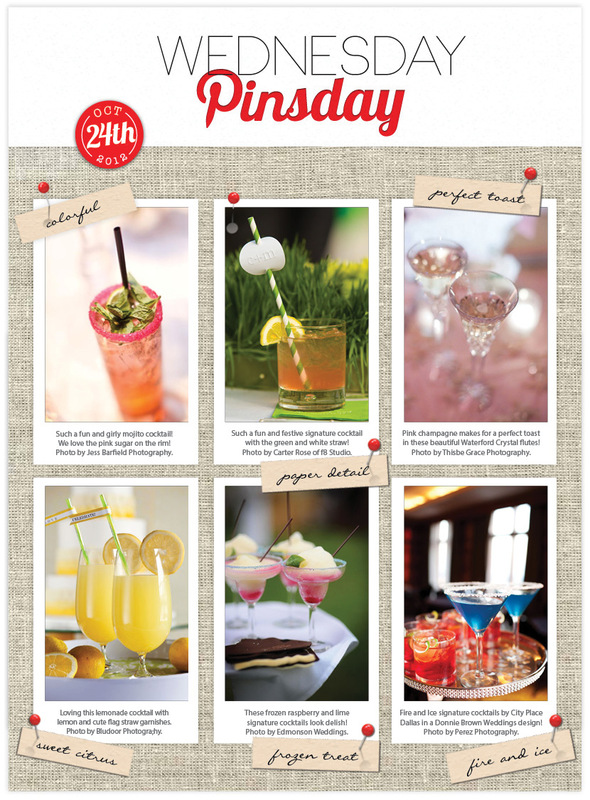 These and more amazing cocktail ideas available on our Pinterest page – Cheers! Photo credit (top left to bottom right): Jess Barfield Photography | f8 Studio | Thisbe Grace Photography | Bludoor Studios | Edmonson Weddings | City Place Dallas, Donnie Brown Weddings, Perez Photography.